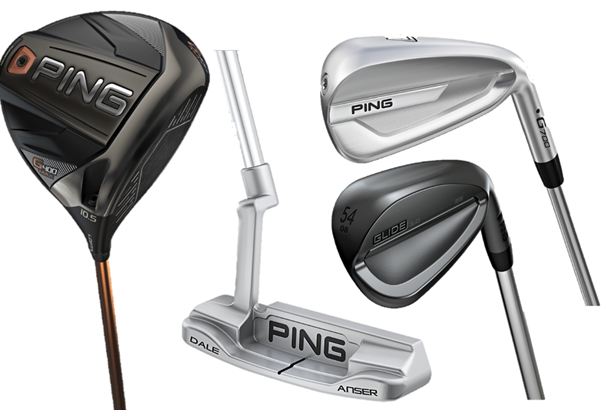 Ping have introduced a new G400 Max Driver along with Ping G700 irons, Glide 2.0 Stealth wedges and Ping Vault 2.0 putters. “We’re on a mission to help golfers play better, and we know that starts with clubs that deliver across-the-board performance gains,” said John K. Solheim, PING president. In the G400 Max driver, PING achieved its all-time high MOI measurements by optimising the crown and face design in the larger-profile, multi-material head. The forgiveness gains are attributable to the 460cc head and nearly four times the discretionary weight created by Dragonfly crown technology and the thin, forged face. A high-density tungsten back weight wraps around the back of the sole to help bring the combined MOI (heel/toe and high/low) over 9,900 gram cm2, while a CG position is lower and farther back than any current driver on the market to make what Ping say is "the most forgiving driver in golf" – surpassing the current Ping G400 driver. A patented precision wheel-cut half groove near the lead edge on the 56⁰, 58⁰ and 60⁰ improves engagement with the ball (specifically low on the face) to significantly increase spin and control from all conditions. The wheel-cut milling process was developed by PING’s engineering and manufacturing teams to enable grooves with a sharper edge radius, which increases interaction with the cover of the ball at impact, creating more friction for improved spin and trajectory control. The grooves in the lower-lofted wedges (46°, 50° & 52°) are milled with a 20° sidewall and a .005" edge radius for optimal full-shot performance. The higher-lofted versions (54°, 56°, 58° & 60°) are milled to a .004" edge radius and a 28° sidewall to impart more spin, especially around the greens. ・Available 4-9, PW, UW, SW in 10 color codes (lie angle). Black is standard. The new products are available for pre-order beginning today.